Downtown Victoria condo, walk to everything beautiful Victoria has to offer. 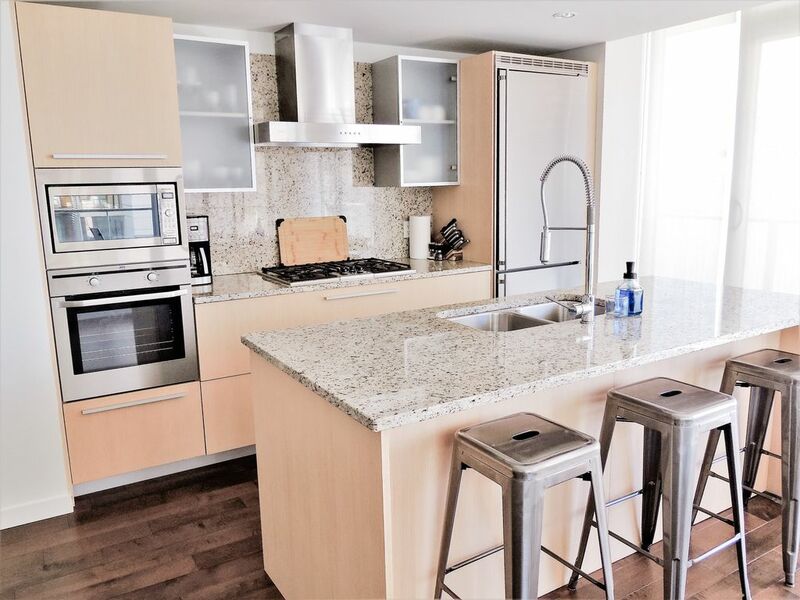 This 865sq foot one bedroom condo has everything you'll need on your next visit to Victoria. The master bedroom has a king sized bed, living room features a pull out sofa bed and the modern kitchen has everything you'll need. One parking spot is included in the rental but if you have a large vehicle you should check that it'll fit in the underground lot. Bike storage can be difficult here as there is a zero tolerance for bikes in the elevator and lobby. There are many places around town to rent bikes. Please note some furniture will be changed out from the photos in the next few months (king sized bed in bedroom and new sectional sofa bed in living room). Please inquire for discounted long term rates of 30 nights or longer. We were both born and raised in Victoria and love this city. We use this property often for our own family to visit friends and family in the city. We have two wonderful young kids that are comfortable in the property with us. This property is close to everything in the city; shopping, parks and restaurants. No need to use the car but the property comes with a parking spot for the stay. We also love using the pool in the summer months, what a rare feature to have in the downtown core. Location is everything for a first visit and this unit was everything. We came to see Victoria and relax. Between our jaunts exploring and shopping Victoria, this condo did not disappoint serving as our daily refresher station and provided safe nightly quiet slumber in a comfortable bed. Particular to our needs we appreciated the secure parking and anonymity moving throughout the building which enhanced our romantic getaway. The unit is fully equipped for cooking, dining and living with a media center perfect for the weekly business traveler. clean, bright and very comfortable! This condo is very clean, has everything you need and the bed is really comfy! The location is perfect as well. We'll definitely stay again if we can! Check in was easy. The unit is well appointed and includes a washer and dryer, a kitchen with all applianes and a super comfortable bed. Towels and sheets are plentiful and great quality. The bathroom has both a shower and a tub. Parking is included. Walking everywhere in downtown is so easy from this location. Public transit is right outside the door too. The building is quiet and well maintained. This is a definite winner!! Great location and well equipped. I spent six days over Xmas/2018 while visiting family in Victoria. Great downtown location, convenient parking space, well equipped kitchen, cozy bedroom and spacious bathroom. Easy check in and out. Thanks Karen.